A knit maxi dress featuring a chest pocket, round neckline, sleeveless cut, and side slits. Chic Lace Jumpsuit For Spring And Summer Marta. This jumpsuit from MonifC is perfect for going out, clubbing, you name it! You will definitely turn heads in this lacy jumpsuit. Combine it with statement heels and a matching clutch for a evening outfit. Casual Outfit For School. How to wear crop jeans with classic canvas sneakers. I f you had shopped around for a good pair of sport high impact bra that is fit for chesty gals, you probably have come across Enell. I can express positive opinion about this sports bra in every aspect possible except probably the price. Glamorise Women’s No-Bounce Full-Support Sport Bra is a medium to high impact workouts full figure bra that runs from 34C to 50G. I don’t think this particular bra is the best on the market, but it is priced just right, which is a big plus. Reinforced wire-free cups provide exceptional support and comfort while the moisture wicking fabric keeps you cool and dry. Here is one hot weather top with cold shoulders and sleeve tie accent in women plus sizes . Although the weather is still chilly outside, every clever fashionista is looking ahead to sunshine and temperature rise, waiting for the spring to come and try that new or never worn before jacket, dress, or shoe. Here is one cozy warm fleece lined pea coat, double breasted, thick enough to keep you warm in chilly spring mornings and late evenings. 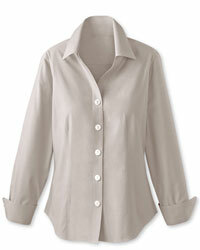 Layer it with your favorite tee blouse and shirt and a pair of comfy ponte pants for work and play. Women’s Jeggings With Criss-Cross Detail Pockets in coral, black white, and fuschia. Colorblock design is one of the fashion trends now. In this dress by Kiyonna, Valentina Illusion Dress, black stretch lace back starts from the shoulder and contrast to side parts and this way trims the waistline and help appear visually slimmer. Colorblock design visually slenderize the silhouette. As Coldwater Creek is having 50 cent sale here is something that will fit your wardrobe and meet your casual needs. These comfortable twills are made of two- way stretch cotton blend fabric which retains its shape and is machine washable. The shirt will matcch the pants. It is from the Cold Water Creek No Iron Shirts collection and has tailored cut made from specially-treated no iron cotton with long sleeves and turn back sleeves. No need to mention it is machine washable again for easy care.